JOANNA MEDAWAR NACHEF, is recognized as the first woman conductor from the Middle East. Born in Beirut, Lebanon, she moved to Los Angeles in 1976. Dr. Nachef is Director of Choral Activities at El Camino College. She earned her Bachelor in Music in piano performance from CSUDH, her Doctor of Musical Arts and Master in Music degrees in Choral Music from the University of Southern California. 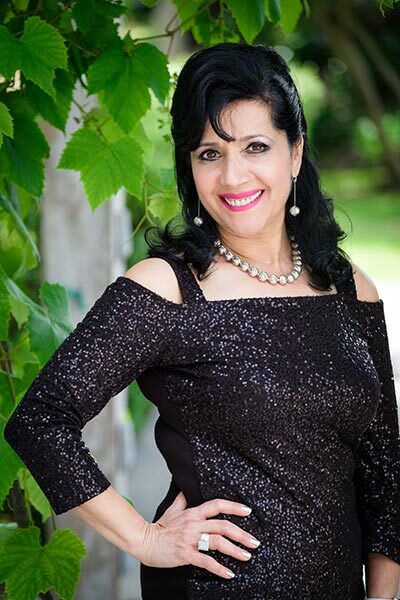 Dr. Nachef is also on the faculty of California State University Dominguez Hills, founder and Artistic Director for JOANNA MEDAWAR NACHEF SINGERS: and choir director at Peninsula Community Church. In 2015, Dr. Nachef retired from her post as the artistic director for Los Cancioneros Master Chorale, after 24 years. She was recently appointed as Artistic Director/Conductor for the newly formed Torrance Pops Orchestra and “Joanna & Friends” 2018-2019 series. She is featured in 1996 Who’s Who Among America’s Teachers, 2009 American Women, 2010 Who’s Who in the World, and the 2012 WHO IS SHE, Institute for Women’s Studies in the Arab World, Lebanese American University. Dr. Nachef has directed both locally and in guest appearances in motion pictures, and toured Nationally and Internationally with her performing groups. She gave her conducting debut at Carnegie Hallin 2005 and returned in 2007 with her Ambassadors of Harmony Concert. In May 2010, April 2013 and May 2015 she conducted three historic performances at Carnegie Hall with choirs from Lebanon, Dubai and Los Angeles. In 2009, she guest conducted at Al Bustan Summer Festival in Lebanon, in December 2013, she gave her conducting debut as the first female conductor in the Arab Region with “Beirut Chants Festival”in Lebanon, and in 2014 conducted the Lebanese Philharmonic Orchestra. Last summer, she was a guest conductor with MIDAM International’s 2ndBiennial Music Tour to Vienna and she just returned in May 2018 from her 6th conducting appearance at Carnegie Hall. She is speaker and “Citizen Diplomat” for the US State Department with the “Global Education Through Technology” project, a charter board member and past president for the LA/Beirut Sister City Organization and alumnae of the U.S. Institute of Peace, Washington D.C. For fall 2016, she stepped up to serve as Interim Dean of Fine Arts at El Camino College. Her numerous awards include the 2005 “Excellence in Arts Award”in Music, the Daily Breeze Director’s 2008 “Making a Difference” Award, the 2010 Living Legend Award for the African Diaspora of Sacred Music and Musicians, the 2012 Lifetime Achievement Award by the Lebanese Ladies Cultural Society, the 2014 Mercury Award for creative programming, the Daughters of The American Revolution’s 2015 State Americanism Medal, the California Ladies Organization 2015 Mother of the Year Award, El Camino College’s Distinguished Faculty Award 2014-2015, the 2017 Mu Phi Epsilon ACME honoree, the 2017 Albert Nelson Marquis Lifetime Achievement Award, and was featured in the “100 Influential Lebanese Figures around the world”, 2017 publication. On November 13, 2017, Dr. Nachef and National of Medal of Arts Honorees Morten Lauridsen and Dana Gioia, received the 2017 Mercury Award from Torrance Performing Arts Consortium for the JMNSingers “Lux Aeterna” Concert.